The First Alabama Regiment of Infantry was organized under the Act ofthe Legislature authorizing the enlistment of troops for twelve months. Three companies were raised in Barbour county by Capts. Alpheus Baker, John Clark and Jere. Williams; two in Pike, by Capts. Augustus Owen and Dawson ; one in Wilcox, by Capt. I. G. W. Steadman ; one in Tallapoosa, by Capt. J. D. Meadows; one in Talladega, by Capt. L. F. Johnson ; one in Lowndes, by Capt. J. D. Conyers; and one in Mobile, by Capt. Ben. Lane Posey. 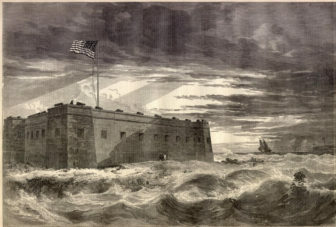 The companies were ordered to rendezvous at Pensacola, for the purpose of relieving the independent companies at that time occupying the captured forts, Barrancas and McRae, and the navy yard. About February io, 1861, the first companies arrived at Pensacola, and the others rapidly followed. It was not until April that the regimental organization was completed, by the election and appointment of the following officers: Colonel, Henry D. Clayton; Lieutenant-colonel, I. G. W. Steadman ; Major, Jere. Williams; Quartermaster, Capt. L. F. Johnson; Commissary, Capt. Henry Shorter; Adjutant, S. H. Dent; Surgeon, J. D. Caldwell, M. D. ; Assistant-surgeon, Walter Curry, M. D.
Soon after its organization, by Act of the State Legislature, but with its own consent, the regiment was mustered into the service of the Confederate States, and was assigned to duty in Fort Barrancas and the heavy batteries along the shore of the bay. Many of these batteries were thrown up by the men of the First Alabama, who, thus early in the war, were accustomed to the use of entrenching tools. Military instruction was not neglected; and, while industriously wielding pick and shovel, the men were thoroughly drilled, both as heavy artillery and infantry. Fort Pickens, Pensacola Harbor, Florida, looking seaward. Fort McRae in the distance. Fom a sketch by mrs. lieutenant Gilman, just arrived from Pensacola. A portion of the regiment was engaged in the fight on Santa Rosa Island, and the whole regiment served in the batteries during the bombardments of the 23d of November, 1861, and the 1st of January, 1862. For its gallantry on these occasions it received complimentary mention in Gen. Bragg’s orders. At the close of twelve months’ service, the regiment was called upon to re-enlist for the war, and seven companies promptly responded. Capts. Baker’s, Clark’s and Posey’s companies were mustered out, and were replaced by Capt. Knowles’ company, from Macon county; Capt. William Pruitt’s, from Barbour; and Capt. J. F. Whitfield’s, from Autauga. The regiment was reorganized by the election of the following officers; Colonel, I. G. W. Steadman; Lieutenant-colonel, M. B. Locke; Major, S. L. Knox; Adjutant, S. D. Steadman; Quartermaster, Capt. Duncan Carmichael; Surgeon, Dr. Schackelford (afterwards succeeded by Dr. Hamilton). The companies were commanded respectively as follows: Co. A, Capt. J. D. Meadows ; Co. B, Capt. Ramsey; Co. C, Capt. Stubbs; Co. D, Capt. R. H. Isbell; Co. E, Capt. Woods; Co. F, Capt. Williams; Co. G, Capt. Riley; Co. H, Capt. Knowles; Co. I, Capt. William Pruitt; Co. K, Capt. John F. Whitfield. In the following pages will be found a sketch of the services of Co. K, of Autauga county. Although the author makes no higher pretence than to be a company historian, yet he has embodied in the story all the facts connected with the history of the other companies, and of the regiment as a whole, that were in his possession. From the day that Co. K joined the regiment, in March, 1862, until the surrender of Gen. Joseph E. Johnston, it shared in all the toils, privations and dangers of the gallant “ First,” and its history is indissolubly blended with it. Therefore, with the kindest feelings, the writer dedicates this little work, not only to the members of Co. K, but to all his comrades in the First Alabama.